Canadian Immigration Officials are monitoring a ship that may be headed to British Columbia. 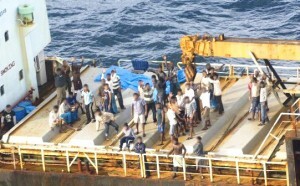 According to a Sri Lanka newspaper the ship is carrying Tamil migrants. According to the newspaper, the Colombo Observer, the ship is carrying 200 migrants, some of them Tamil Tigers. The Colombo Observer reported that the ship was last spotted in May in the Gulf of Thailand.MV Sun Sea earlier known as Harin Panich 19, is captained by an LTTE Sea Tiger leader Vinod and manned by a 24-member crew. The Colombo Sunday Observer reports that the ship was heading towards Australia two weeks ago and the Sri Lankan Government tipped off the Australians. It also says that Canada is likely to admit the ships entry, but deny citizenship to those identified as LTTE.Just last October a ship that had crossed the Pacific Ocean and was intercepted in Canadian waters. There were 76 Tamils aboard, which are now in the refugee system. Their claim was that Tamils were still being persecuted by the Sri Lankan government. Canada’s Immigration Minister, Jason Kenney, is trying to streamline the refugee process. Last year it announced VISA requirements for Mexicans and citizens of the Czech Republic due to bogus refugee claims. Refugee Claims are bogged down in bureaucracy with bogus claims, while real refugee claims are also held up. The governemnts new procedures are said to speed up those claims.